Over 22,000 people above 64 years old are still actively working past the regulated age in Cambodia, according to the latest UN Report. While this in itself may not present a large problem, this population is also living with little to no support from their family members, especially those in rural areas, where the younger generation have taken to move to urban areas or abroad for better working opportunities. As a result, many of Cambodia’s senior citizens are confronting various issues such as being overworked, poor health, isolation and poverty. Recognising these challenges, the Cambodian Red Cross, in partnership with Pfizer Inc and the International Federation of Red Cross and Red Crescent Societies (IFRC), established a Healthy Ageing Programme, designed to help improve the lives of elderly people in rural communities by promoting the importance of health and education on non-communicable diseases. The national society is the third in the world to show commitment in implementing the Community Based Health Ageing Programme after Montenegro and India. 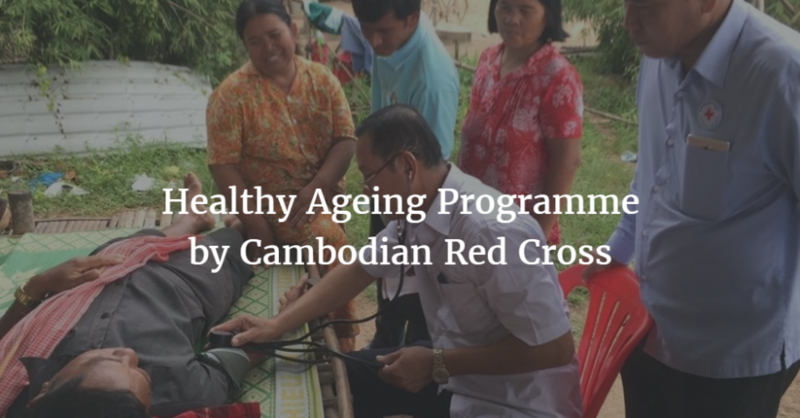 The Cambodia Red Cross carries out an auxiliary role to the local government and the country’s ministry of health in promoting this programme, which also contributes to the World Health Organisation’s Global strategy and action plan on ageing and health. 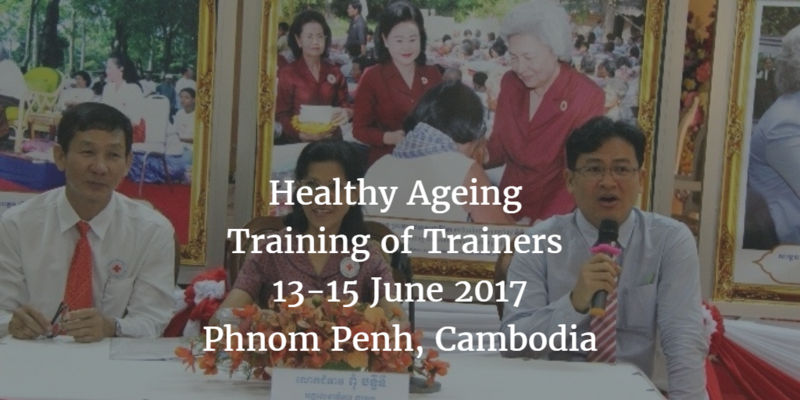 A three-day training to develop trainers on the Healthy Ageing Programme was recently conducted in Phnom Penh, bringing together 36 participants from 25 of Cambodia’s provinces. 87 Community Red Cross volunteers were trained to support the programme, after which they will conduct 18 community outreach health screenings, education sessions on general health, how to prevent non-communicable diseases, meditation and other health promotions in targeted communities. A total of 87 Red Cross volunteers were recruited and received the community based healthy ageing trainings with nine important topics including “Life-course Approach, Assessment, Behaviour Change Preventing Non-Communicable Diseases, Preventing Falls, Preventing Social Exclusion, Healthy Eating, Physical Activity, Lifelong Learning & Community Outreach Action Plan”. 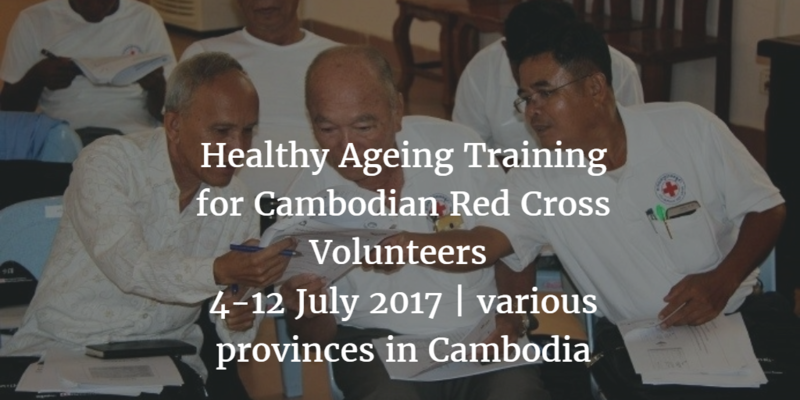 Afterwards, 2-day training courses were organized by Cambodian Red Cross Head Quarter and Provincial Branches in three targeted provinces: Prey Veng, Svay Rieng and Kampot provinces during 3-4, 5-6, and 11-12 July 2017 respectively. At the completion of the training courses, the trained Red Cross volunteers will conduct outreach project will be implemented in three provinces, Prey Veng, Svay Rieng and Kampot, targeting 500 elderly citizens, in 9 villages and 18 health education sessions in providing and implementing the “Healthy Ageing” intervention and health promotion including health screening, physical exercise, healthy eating and lifelong learning and meditation sessions for elderly people living in communities. These outreach sessions were implemented during 19-25 July 2017. In total, about 685 elderly people participated in and benefited from the community based healthy ageing interventions. Around 3,000 booklets on healthy ageing will be produced and distributed to 25 Red Cross branches and communities. See the outreach report.